The Improved Postal ID is the newest government identity card issued by the Philippine Postal Corporation (PHLPost). Equipped with features that aren’t typical of an ID card, it is expected to meet today’s challenges on identity fraud and falsification of documents. Additional physical security features have been added to the card such as a ghost image of the applicant and hologram of the running mailman. These new features allow tellers or frontliners to verify the authenticity of the card immediately and easily without having to use special equipment. A special ink that illuminates when subjected to ultraviolet light called the UV ink has also been infused on it. Moreover, the uniqueness of each applicant is checked via the Automated Fingerprint Identification System (AFIS). It is a biometrics-based uniqueness test that compares an applicants' fingerprint to the fingerprints database records, and therefore, ensuring his identity. Very soon, value added features that will surely benefit consumers nationwide will be put to the card. 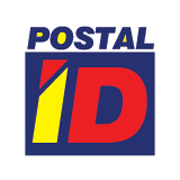 Launched in April 2016, the Improved Postal ID is now available for application. Filipinos and foreign residents of any age or occupation may apply for it. Application forms are available in any post office, and can be downloaded online. The Improved ID shall be valid for three (3) years for Filipinos and for foreign residents with Special Retiree’s Resident Visa (SRRV). For the rest of the foreign residents, it will be valid for one (1) year.